When it comes to tree planting or transplanting trees and shrubs, it’s not as simple as digging a hole and filling it with a plant. Treetech’s experienced staff plant to industry standards, which gives the plants the best possible chance to survive. Our arborists excel in identifying tree and shrub species, understanding their needs and interpreting yours. Whether you need to replace or transplant one specimen or get an entire garden shrub border in the ground, you can trust our team to do the job well, no matter how big or small. Our staff can assist with species selection as not all varieties suit all locations. Even in a country as small as New Zealand, the climate can vary dramatically, especially in winter. Plants and trees that do well in the North might not in the South. If you have a tree or shrub that requires transplanting we can provide the expertise to allow the best possible outcome for any tree transplantation. 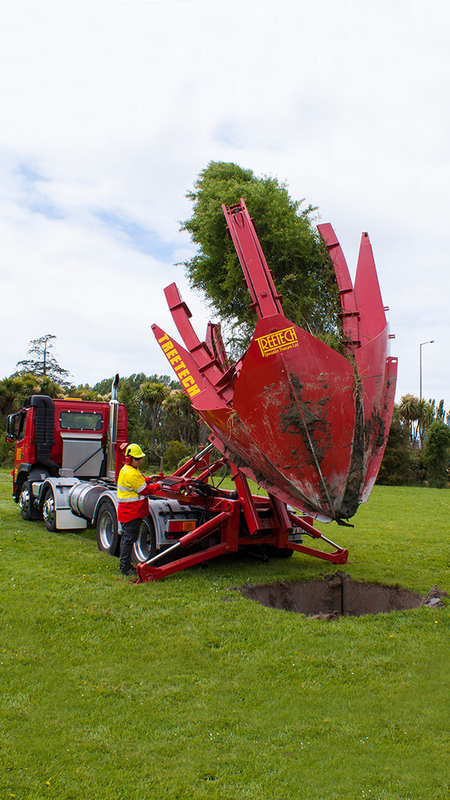 Our truck mounted Tree Spade is designed to dig, transport, and replant a tree, providing a cost effective method of transplanting a large number of specimens into a single site, or moving a badly sited tree into a more appropriate setting. The angled blades of the Treetech Tree Spade make the root ball compact with minimal damage to roots. The soil remains in contact with the roots after digging and moving to the replanting destination. We can source trees and plants in bulk, provide instructions for their care and take care of their ongoing maintenance with our pruning, trimming and shaping services. Our skilled planting staff are available to carry out large scale planting projects. And because we also provide landscaping and consultation we can ensure any size tree and shrub planting project is a success for the long-term. From council parks and streets to gardens, rural properties and complete subdivisions, our professionals can provide arborist services to suit all situations. Whether your project is commercial or residential, large or small – contact us now, our consultants are ready to work with you. Contact us today for bulk tree orders, tree planting and tree transplanting.